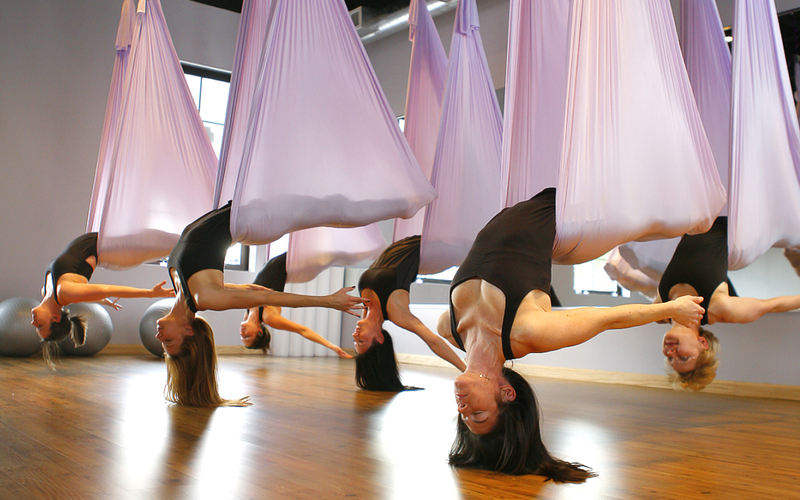 ​​A yoga practice that integrates aerial yoga, even if just once or twice per week, includes pushing, pulling, holding, twists, backbends, forward bends, hip opening and so much more. You can work your shoulders, calm your nerves, and leave class floating on air. The Yoga Trapeze & the Aerial Yoga Silks give you similar results with a different experience. Both the Yoga Trapeze & the Aerial Silks have seperate advantages. We suggest you try both! Any yoga trapeze class will offer an excellent strength building workout and tons of spinal traction that will leave you craving more! Aerial Yoga is an artistic form of yoga that integrates mindfulness and breath into a beautiful physical practice. The stretchy, silky material of the hammock assists well with mobility, flexibility, strength, focus, and balance. Soft inversions also aid in decompression for the spine. Any aerial silks class will help you to explore postures deeply in a challenging but always fun way, leaving you saying "I didn't know I could do that!"